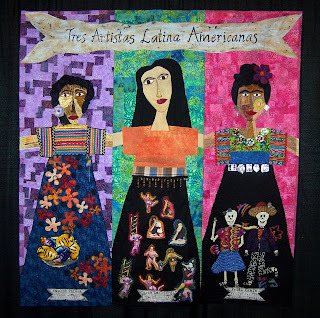 group (L to R: Peggy Calvert, Anne Copeland and me) art quilt made for a special exhibit at Festival in Long Beach; it has been hanging in an art gallery in downtown Orange, CA since September to be part of their 2-month long Day of the Dead celebration. I went by the gallery last week, and it was gone - that is to a potential buyers house to try it out! It is officially SOLD. Congratulations on the sale of your beautiful quilt!